Featuring in most visitors’ Maldives experience as nothing more than an urban smudge on the otherwise pristine horizon, the capital Malé is normally overlooked by those drawn to the archipelago for its luxury resorts. For others, a day trip is enough to quench the curiosity started when the lego-brick metropolis first leapt out of the ocean moments before they landed on nearby Hulhulé island. But for those seeking a real glimpse of life for one third of Maldivians, a longer look at the brimming city – often dubbed the Manhattan of the Indian Ocean – is a must. Here are 10 suggestions – from the unusual to the essential – for your visit to Malé. The seat of kings and sultans for 900 years, Malé has plenty of stories to tell. Upon arrival from the airport, one can take a stroll up Boduthakurufaanu Magu – named after the 16th century vanquisher of the Portuguese, and subsequent sultan – to Jumhooree Maidan (republic square), which commemorates the sultanates final abolition in 1968. From here, you are just a stone’s throw away from the national museum, the 17th century Hukuru Miskiiy (Friday Mosque), and Muleeaage – the president’s colourful official residence. Official tour guides are registered with the tourism ministry, or can be recommended by your hotel or guest house. Obscure in places, but all the more fascinating for it, Maldivians are proud of their history and will be keen to share it. The Maldives may be envied throughout the world for an abundance of marine life and palm-fringed beaches, but these resources have not helped achieve culinary greatness. Isolated in the tropical seas, Maldivian cuisine has had to rely on the creative combination of coconut and tuna for much of its history. However, these restrictions have resulted in at least one dish that can surely hold its own anywhere. Mashuni roshi consists of tuna, coconut, and chilli in a combination that shouldn’t really work – but absolutely does. Eaten with roshi (thin, chapati-like bread) and maybe a fried egg, mashuni is the best way to start a Maldivian day. Available almost everywhere, the ‘kada’ cafes in Malé’s carnival area do different types of this hidden gem as well (and as cheaply) as anybody. Between four and six, Malé stands still (or sits down) for ‘hedhika’ – loosely translated as short-eats – which creatively combine tuna, coconut, potato, and egg in a smorgasbord of after-work snacking. More adventurous gastronomes should head to the mobile ‘Gaadiya’ stands sprinkled along Boduthakurufaanu Magu on the south of the island. The closest thing the Maldives has to street food, here you can try ‘mas kashi’ – a selection of dried fish, coconut, and mango. A fresh kurumba (coconut) should be kept on hand for those who find Rihaakaru (the Maldives’ answer to marmite) too overwhelming. For those really wishing to get a feel for island life, they must first get a feel for ocean life. As the capital – and the official point of entry to the Maldives – Malé remains the transport hub, with everything that flies or sails making its way to the city. With 10 airports, the Maldives has rapidly expanded accessibility to the atolls, but it is the nation’s ferry network that has traditionally taken islanders to and from their capital. A ferry to the country’s further reaches can take days, but the central atolls can be reached within a few hours. The recent blooming of the guest house sector means there are plenty of options for those wishing to take a slow boat out into the atolls from Malé – a truly Maldivian travel experience. By far the largest urban centre in the Maldives – and one of the most densely populated islands in the world – Malé has had to build upwards, resulting in a towering mass of high-rises huddled into its 6 square kilometres. The large and increasingly youthful population has led to a thriving cafe culture, while social mores mean that coffee is the beverage of choice for most. As a wave of ever-swankier coffee shops continues to immerse the city, none can rival the view from the Azur restaurant on top Hotel Jen. A trip to the 11th floor feels like you have travelled to the top of the Maldives and, in a country with an high point of 2.5 metres, you very much have. Escaping from the heat, the spectacular view of the surrounding islands will set your pulse racing regardless of what you order. While the hum of the city may seem a million miles away when spending time on one the Maldives’ 100 plus resorts, the capital is in fact in close proximity to a large number of island retreats. Recent decades have seen more resort development in the country’s northern and southern atolls. However, the vast majority of resorts are less than an hour away from the centrally located capital, which shares Kaafu atoll with over a third of the country’s resorts. Using the more modest trappings of Malé and its surrounds as a base, late bookings and other last-minute deals can put a few nights of luxury within reach. While placing a trip to the local market on any travel itinerary will often set eyes rolling, the fish and fresh fruit markets in Malé give an insight into life in the atolls that is hard to get elsewhere. Located just yards from Jumhooree Maidan, the fish market is the beating heart of the Maldivian fishing industry, upon which the nation depended for centuries before the advent of tourism. Outside, returning fishermen can be seen carrying their catch (most often tuna) across the busy street to be weighed and sold. In the harbour opposite, schools of fishing dhonis bob gently, strewn with washing lines and weathered fishermen, weary from weeks ploughing the country’s enormous fishing grounds. Next door to the fish market is the county’s only fresh fruit market, demonstrating the small (in quantity) but sweet products of Maldivian agriculture. 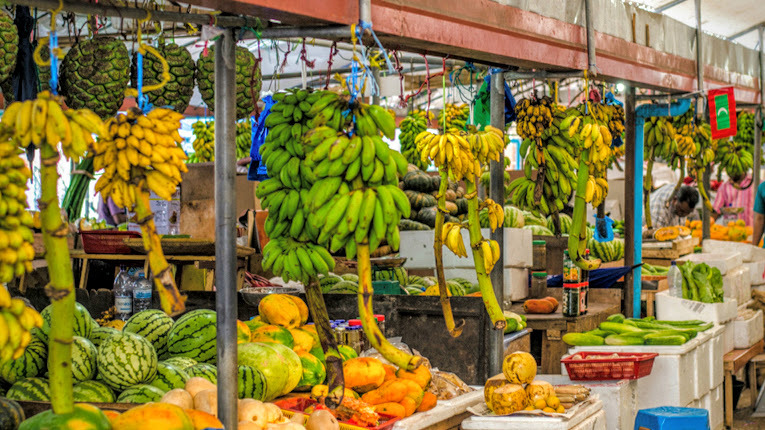 Mango, papaya, guava, bananas, watermelon and, yes, coconut and dried fish, are available here. 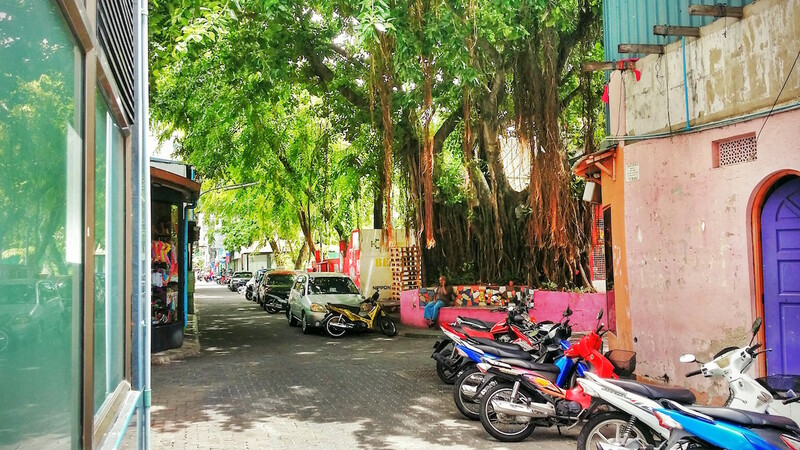 Visiting the outskirts of a capital city would not normally make it onto a short itinerary, but Malé’s suburbs are not like any you will have seen before. To the west of the city lies the small island of Villingili (Villimalé), a former royal bathing area, prison, and resort (in that order). Villingili is now a residential suburb, whose quaint beach offers spectacular views of Malé, while the prohibition of motorised vehicles brings a soothing calm after the din of the main island. To the north, and connected to the airport island, is Hulhumalé. Reclaimed in its entirety from the lagoon in the late 1990s, the island is seen as the antidote to the twin problems of crowding in the capital and isolation in the atolls. While the still-expanding island cannot claim the character of Villingili, the prevalence of guest houses (the most in the country) has spawned ample facilities for dining and watersports. 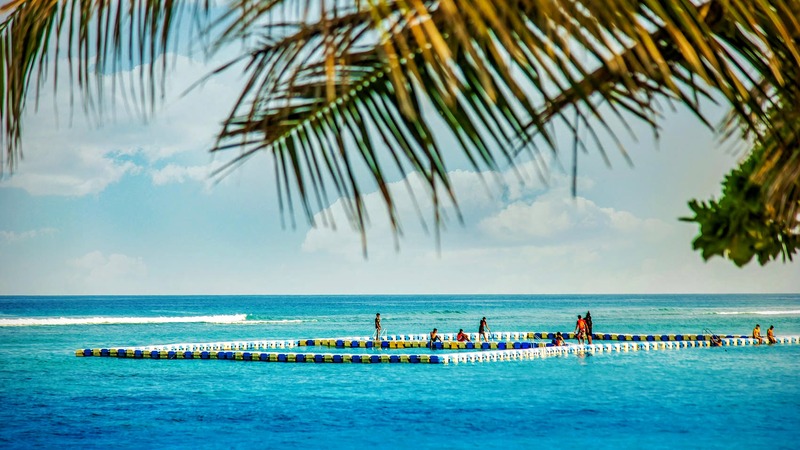 For those looking for a workout, Hulhumalé’s floating swim track offers a unique dip. Less crowded than the track in Malé, you can front-crawl alongside the coral and butterfly with the butterfly fish (but beware of the local children – they dive bomb!!). The unique nature of the archipelago means you are never far away from the incredible beauty of the coral reefs. The clear waters near the capital may seem calm in comparison to the buzzing metropolis, but it is beneath the surface the Maldives really comes to life. Snorkelling and diving excursions can be arranged from Malé and its suburbs, with North Malé atoll featuring some of the country’s top dive sites. The abundance of marine life in the shallow waters over the reef means you can also see a dazzling array of species without strapping the oxygen tank. An alternative way to see the underwater neighbourhood is to take the local whale submarine. The sub departs every 90 minutes from the Malé – Villingili channel and can usually be booked through local guest houses and hotels. After you’ve been in Malé for even a short period of time, you’ll discover that motorbikes are more than a means of transport – the capital has 40,000 of them registered to its 130,000 residents. With temperatures hovering around 30 degrees all year round, walking is not an option favoured by many. Combined with the lack of open spaces, this has turned leisurely rides into a major pastime. You are sure to make friends quickly in Malé who will be happy to take on a tour of the city’s winding streets. With the majority of the major points of interest located on the the north-east of the island, a bike ride around the lesser-seen wards is a practical way of getting a full view of life in the capital. Running down the eastern side of the island, Henveiru is undoubtedly the most scenic of Malé’s four wards. Fanned by cooling ocean breezes, the rare open spaces come alive in the afternoons. Henveiru’s ‘artificial beach’, while not imaginatively named, offers a welcome leisure activity for residents otherwise deprived of the very thing for which the country is famous. On Fridays in particular, the beach comes alive, offering ample opportunities for unabashed ‘people-watching’. The surrounding area is packed with coffee shops and restaurants, where you can happily watch the action on football and volleyball pitches opposite. Alternatively, you can gape at the unfathomable ballet of planes landing and taking off from the tiny strip that is the adjacent airport island. As with much of Malé – the Maldives’ metropolis, Manhattan in the Indian Ocean – it is something that really has to be seen to be believed. Hulhule Island Hotel, the only hotel located on the International airport island — Ibrahim Nasir International Airport, is a modern and exotic hotel catering to the diversified needs of guests.